A riveting novel of psychological suspense—a domestic drama full of secrets and twists—about a woman determined to have a child, her ambivalent husband, and a pregnant teenager with a secret agenda of her own. The characters are loathsome. Their agenda – calculating, self-absorbed, manipulating, downright unlikable. Adrienne and Gabe won’t exactly pull at your heartstrings, you feel zero sympathy towards them and as their secrets along with their true colors are revealed, it’s no surprise your arm length distance served you correctly. Leah is a snake in the grass, you know from the start she is sneaky, not to be trusted. Brown does a wonderful job with the realistic interaction and complexity of the characters. The narrative has a few surprises matched with predictable scenarios. Plenty of secrets make the story exciting casting an overall darkness. The narration alternating between Adrienne and Gabe reveals their psychological state, their very different perspectives are full of humor and bold faced honesty, you comprehend their strength and weaknesses, their vulnerability and invincibility. The dynamics of their marriage is plausible and a hoot. Brown’s therapy background infused in her characters psychological make-up make this a darkly fascinating read with surprising twists. Smooth writing paired with a fast pace makes this very entertaining with despicable protagonists. 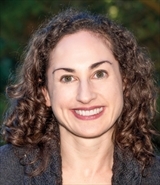 Holly Brown lives with her husband and toddler daughter in the San Francisco Bay Area, where she’s a practicing marriage and family therapist. Her blog, Bonding Time, is featured on PsychCentral.com. Connect with Holly on Facebook. 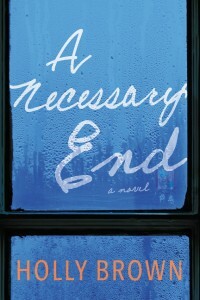 Thrilled to be included in the tour for Holly Brown’s A Necessary End. Be sure to click on the TLC banner to check out the entire tour schedule. Thank you TLC!